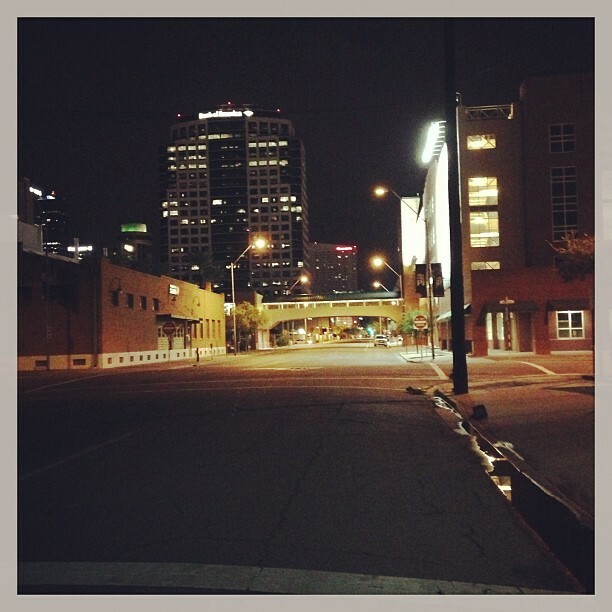 Jonathan and I drove into Phoenix for the first time a few nights ago. We were going in to see a singer/songwriter friend play a gig at a bar downtown. It was a beautiful night--a haboob had just come through (our first!) followed by a burst of thunderstorm, turning the sky dull, and then brown, dark with rain and bursts of lightning. So the air was cooler, perfect for walking. Since a baseball game was just ending at the stadium, we got a scenic tour of the downtown area while we tried to find open streets. Mostly, the city felt empty to two Bostonians used to post-Fenway mayhem. But it was a safe emptiness, a street-lit, quiet stroll, a calm after a storm, like the city belonged to us and who else needed to be there anyway? Driving home, I looked over at Jonathan in the driver's seat and I was taken back to when we first started dating. On one of our first dates we went down to the North End in Boston and had pizza in a tiny Italian restaurant, where they seated us in the back next to the ovens and we sweated double from the nerves and the heat. We ordered bacon pizza. Later we walked down to Long Wharf and sat out by the water for a long time, then he drove me home. But pulling into Cambridge around midnight, I somehow let him convince me to stay out another hour and drive to Norwood, so I could see where he grew up. Maybe that's why I fell in love with him anyway, because he could get me to break a rule or two and do something spontaneous, to eat bacon pizza and stay out long enough to make my roommates ask questions. I distinctly remember driving down the highway with him that night. In the blurry haze of newness back then I couldn't quite make out who it was sitting next to me in that car. And he may have thought he knew me, even thought he loved me, but can't we see now that he could only knew such a small part of me? The real knowing and loving comes on much later, and is somewhat less romantic, less hazy, more true. I found myself thinking of these things as we drove out of Phoenix, as he played drums on the steering wheel to a Macklemore song, like he does all the time, like he always has (and sings the drum parts). He still does sing me funny songs, even when I don't want him to (and makes me sing them too). And its nice to remember that when it feels like everything has changed in the past two years, some things don't. I still have the same view from the passenger seat that I did two years ago, and it's always been a good view from there.